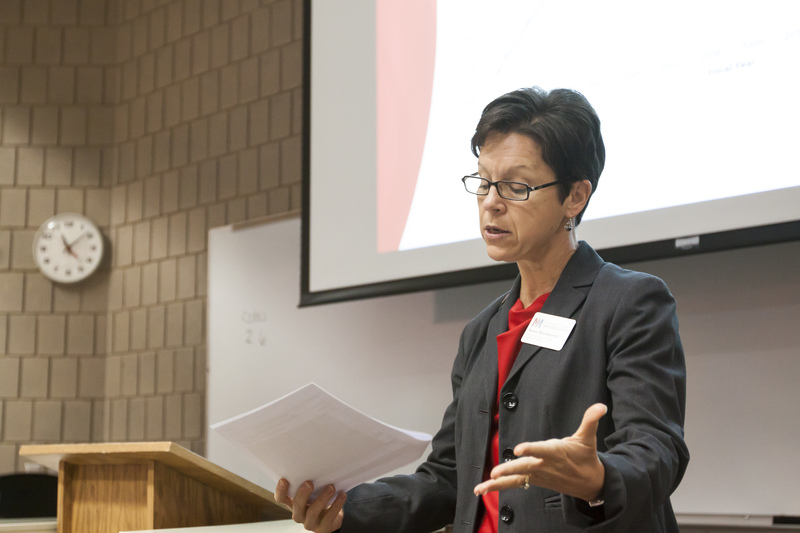 Provost Anne Blackhurst addresses students at a special budget forum on Friday morning in the Center for Business. MSUM mailed early retirement offers to 97 faculty members Friday, attempting to avoid layoffs as the university grapples with a long-term deficit. Administrators said they plan to grant at least one offer per department, or 34 to 35 total, reducing the full-time faculty force by about 9 percent to match persistently declining enrollment. Letter recipients, who are age 55 or older and have served at least five years, face an early November deadline to accept or reject the offers. Meanwhile, an advisory group has recommended criteria to evaluate academic programs for possible cuts if the buyouts don’t save enough money to solve the deficit. MSUM officials declined to release the names of professors who were offered early retirement packages, citing privacy law. Full-time student numbers have dropped about 11 percent in the past four years, from 6,500 in 2010 to about 5,800 this fall. If enrollment had been stable, the university would have about $4.6 million more money available, said Anne Blackhurst, provost and senior vice president for academic affairs. She emphasized this drop mirrors a trend throughout MnSCU and is due to many factors, including a smaller number of Minnesota high school graduates, fewer North Dakota students crossing the river, a booming local economy, competition from for-profit institutions, turnover in MSUM enrollment management positions and higher admission standards. While the student body shrunk by about 700 students from 2010 to 2013, the number of faculty has only decreased by the equivalent of 11 full-time positions. Even after the buyouts, the university would have a 16:1 student-to-faculty ratio, Blackhurst said. Graphic communication professor Mike Ruth, one of the nearly 50 professors and administrators who attended Thursday’s meeting, asked to be pardoned for his candor before addressing the crowd. Asked about MSUM’s long-term enrollment goals, the provost said the university hopes to stabilize to the equivalent of 7,000 full-time students by 2025. Administrators said they plan to resolve this year’s projected $2.2 million shortfall through a hiring freeze for most positions, finding other savings, spending money from last year that was budgeted but not spent and, ideally, increasing spring enrollment. Next year, officials project a $4.9 million deficit and potentially another $3 million hole the year after that. The buyouts will go a long way toward fixing that long-term problem, Blackhurst said. The faculty union’s official position, Gracyk said, is to fix the rest of the deficit by, in part, eliminating positions filled by short-term contracts and adjunct faculty. Since the buyouts will only provide a long-term savings of about $4 million, philosophy professor Phil Mouch asked whether MSUM would go through a similar process next year. The buyout offers will exhaust the university’s extra cash, Mahoney said, although a MnSCU-mandated emergency reserve fund of about $5.2 million would remain intact. The early retirement offers, “really does blow the bank” and the policy allowing these kinds of buyouts expires next spring, said president Edna Szymanksi, who retires in June. To achieve additional savings, a Deficit Reduction Advisory Group is recommending evaluating each academic department based on cost and enrollment. The Faculty Senate will consider the proposal at a meeting today. Gracyk pressed MSUM officials as to how they arrived at their deficit projections, which include no tuition increase two years from now, a 3 percent hike in employee pay and benefits as well as further declines in enrollment. “If I adjust those numbers, it doesn’t look so dire,” he said. Jan Mahoney, vice president for finance and administration, responded: “I want to be realistic and conservative. After the more than two-hour meeting, accounting professor Kim Mollberg noted how hard it is to deal with long-term deficit predictions.